The Devil or the Donald? The hour grows late, and Donald Trump is pants-crappingly close to clinching the Republican nomination for president, with no sign of slowing down. Trump, widely reviled as a monster by people on the Left and the Right (minus his enthusiastic loyalists), has been called many things: racist, demagogue, sexist, liar, con man, vertical weasel roadkill display case. But worse than Lucifer himself? Now, before you make (accurate) accusations of hyperbole, hear the argument in all its satanic glory. These are the 6 reasons you’d rather have Satan as president than Donald Trump. You won’t catch Satan flip-flopping on the important issues. Didn’t accept Jesus Christ as your Lord and Savior? You’re going to hell and you’re gonna be tortured, I guarantee it. I don’t see Satan standing at the Gates of Hell, patting you on the back, and explaining to his demons, “Look, I know this guy, he’s a great guy, and I think he’s gonna fit in great here. There’s really no reason to torment this one, he’s really a friend, he’s done a great job. I know what you’re thinking, and you know, to be honest, a lot of people have been asking me, ‘Oh, why spare this guy?’ A lot of people. You know, those are foolish people.” Lucifer just gets right to the spanking you deserve. Donald’s attacks on racial, national, and religious groups earned him support from David Duke of the Ku Klux Klan, as well as neo-Nazi types who called Trump a “glorious leader” and “ultimate savior,” adding “Heil Donald Trump” for sh*ts and giggles. While that doesn’t seem to bother Trump fans, some of us don’t like supporting the same candidates as white supremacists. A guy praised by Nazis? That should really be the first clue you’re voting for the wrong person, don’t ya think? I mean, Jesus. Neo-Nazis and the Klan are no fans of Satan. First, he’s not white. Second, they often claim to be Christian groups. I promise you they claim it, believe me. And Christian groups — even violent, racist, extremist Christian groups — aren’t about to endorse the Great Deceiver. So I guess they would prefer Trump over Satan, but as for the rest of us? We’d go for the guy the people wearing white hoods or swastikas hate. Seems like the right thing to do. All this talk from Trump about building his “gorgeous wall” to keep out Central and South Americans and “temporarily” banning all Muslims from entering the country even has some conservatives calling foul, though a deeply unsettling number agree with him, including his “Muslim friends” who are “so happy” with his idea. For those of us who see such things as unwise, ineffective, unfair, immoral, illegal, unconstitutional, etc. etc. etc. etc. etc. etc. etc., we need a candidate more accepting of outsiders, someone who doesn’t discriminate, someone with a sensible path to citizenship. Enter Beelzebub. Satan doesn’t discriminate. He doesn’t care if you’re black, white, Hispanic, Muslim, Christian, atheist…he will tempt you just the same, and of course victimize you for all eternity with enthusiasm. Sure, he may not get to torture any True Believers, as they will be elsewhere, but that doesn’t mean he wouldn’t welcome them in a heartbeat if they showed up at his Gate. He wouldn’t turn people away based on race or religion or political persuasion or nation or origin. You know, he has a heart. Donald Trump, already suspected of being a blithering idiot, recently bestowed this little nugget of wisdom on the American people: “The other thing with the terrorists is you have to take out their families, when you get these terrorists, you have to take out their families.” What a repetitive nincompoop. Who exactly does he think dies when we drone bomb weddings, funerals, and neighborhoods? The terrorists’ unlikable tax attorneys? Lucifer doesn’t go there. Is your older brother a sinner? That doesn’t mean Satan will up and light you aflame while flaying your back to sinews with a bullwhip — while demons punch you repeatedly in the crotch — for all eternity. The Devil only does that to people who deserve it. You know, Muslims, Jews, atheists, agnostics, Hindus, Buddhists, Sikhs, and so on. And hey, if people deserve their punishment, no legal fees! Ha. Ha. Ha. Ha. You have to be some serious kind of @$$hole to mock people with a physical handicap. 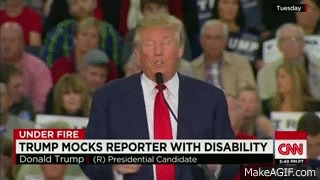 But that’s exactly what The Donald did in South Carolina, mimicking the arthrogryposis of New York Times reporter Serge Kovaleski. Of course, the pompous spray-tanned gasbag later denied doing exactly what he did. Great, now he’s mocking people with Alzheimer’s. Donald Trump, despite all his bragging about being “really, really rich,” and touting himself as a business wizard capable of “beating China all the time” if given the White House, has seen four businesses go bankrupt. Now, he is a successful global businessman, no doubts there, even though in the beginning things were not easy for him. He grew up in Brooklyn. His father gave him a small loan of a million dollars. And from that nothingness he pulled himself up by his bootstraps and made his fortune, even if there were some things money simply couldn’t buy. Hell, of course, has never gone bankrupt. Satan has been running it successfully for thousands of years, and not a single demon lost his job. Satan also has extensive foreign policy experience, particularly in the Middle East, but elsewhere as well. It’s a big job, tempting billions of people. The Donald may drone on and on about the “good deals” and “great deals” he makes, but zero of them come close to rivaling a “Deal With the Devil.” Satan is such an effective dealmaker, he convinces people to sell him their souls. Their souls. Now that’s a man who can make good deals.